Born in 1919, Hassan Djaafar has left behind such an artistic legacy in the art scene, especially in his home origin, West Sumatra, Indonesia. Being a globe trotter of having vast experience in Europe in his early life, he subsequently employed his life’s journey onto his artistic works. It is apparent that his paintings are a manifestation of his life. Known for his impressionist technique and art style, he had the tendency to produce masterpiece via European-styled brush strokes and colour schemes. 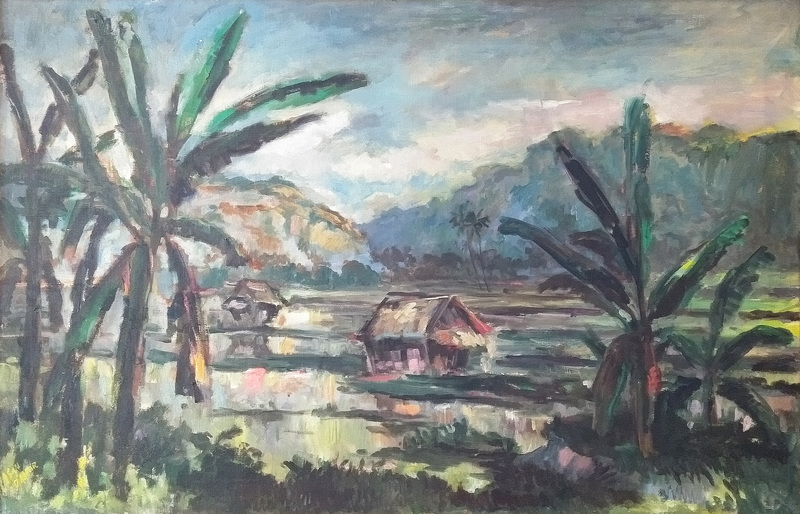 This is evident in the following artwork, Rice Fields in Indonesian Landscape, in which he depicts a tranquil home which resides in the midst of a paddy field. His use of colours to showcase the greenery of the scape is immensely captivating and captures its serenity. He undoubtedly portrayed a stunning view of Indonesia’s beautiful village scape that allows the viewers to truly appreciate its natural beauty.